****This post is a repost of my original entry. 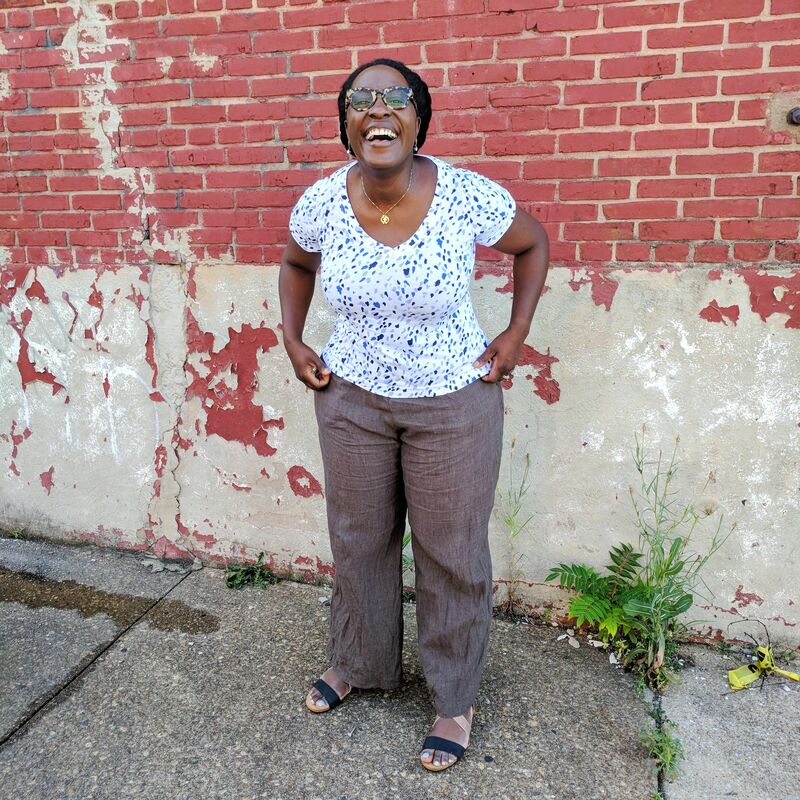 Due to some technical difficulties, I lost a year’s worth of blog posts. 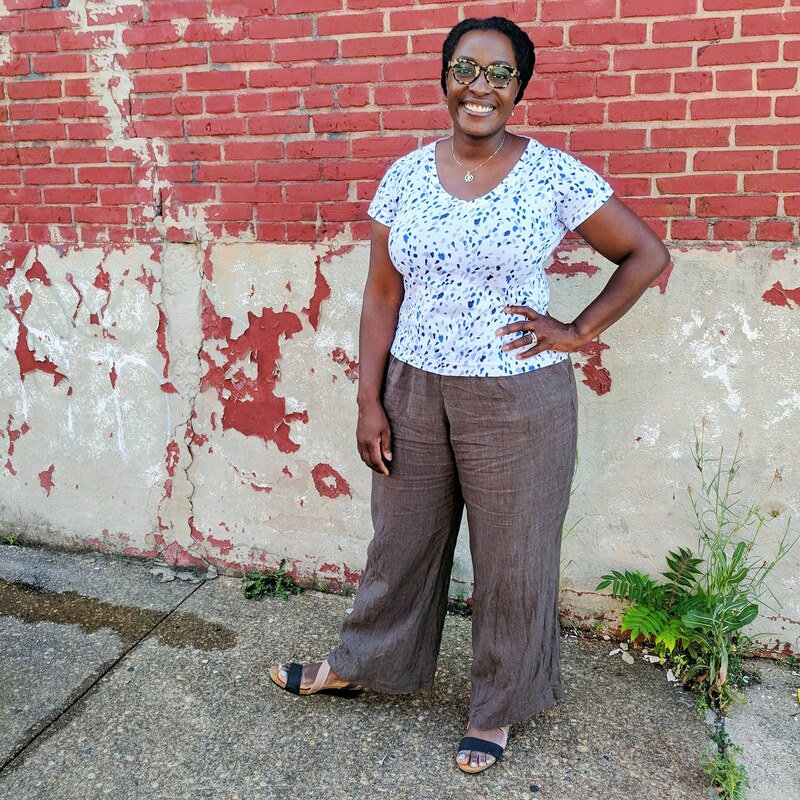 While I’ve made my fair share of pants and jeans in the past, I can’t say they are my favorite to put together. I have a bit of a struggle fitting pants so I tend to avoid them. 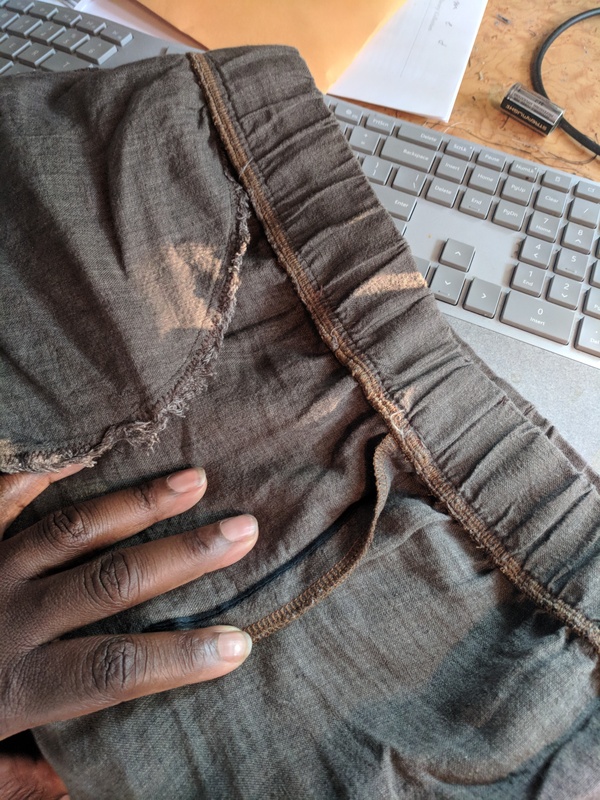 But, I get extremely desperate for pants each year, try to buy some RTW, get totally demoralized and ignore my need for pants for another 12 mos. 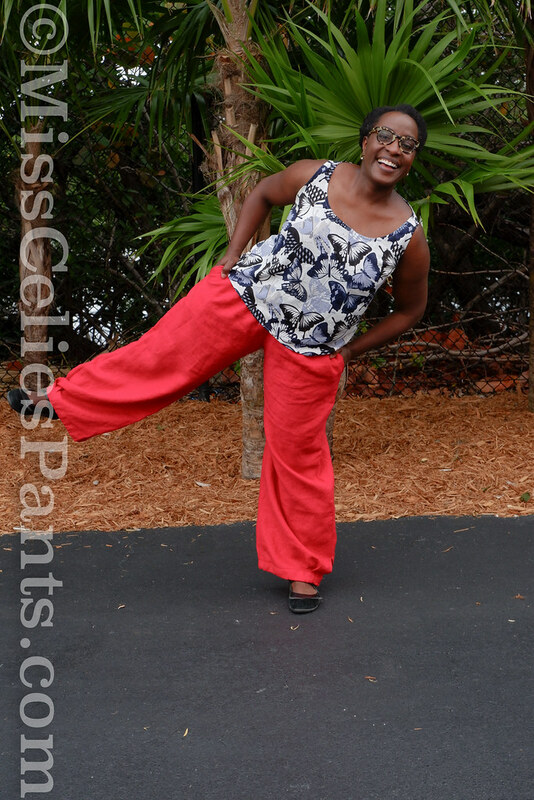 Well, with a vacation looming last month (it was mah-velous), I knew I needed pants. My thighs touch and in the summer in can be terribly uncomfortable. We were going to be doing plenty of walking and flying. Shorts won’t cut it so pants it is. 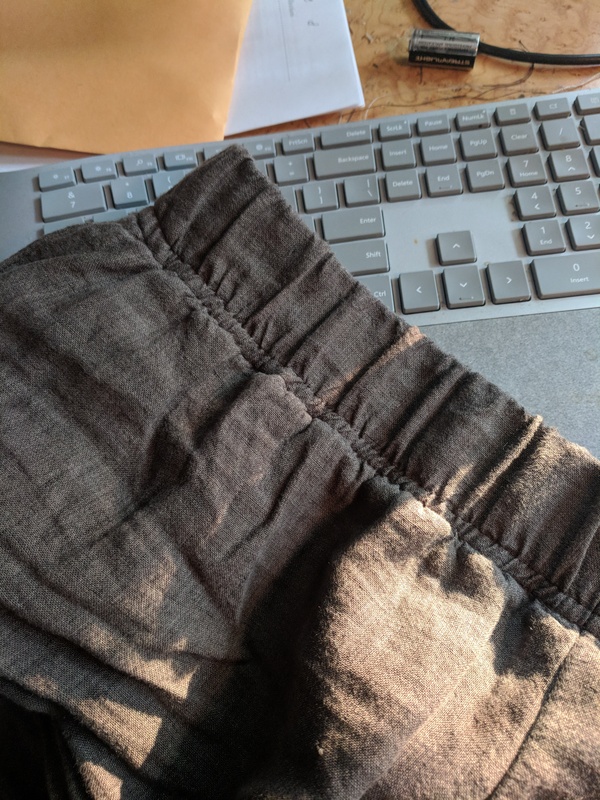 I settled on making a pull on pair because I didn’t want to invest a lot of time constructing pants that might not fit well. And, if I’m being honest, I hope to lose some winter weight I picked up and won’t have to worry as much about the fit later on. 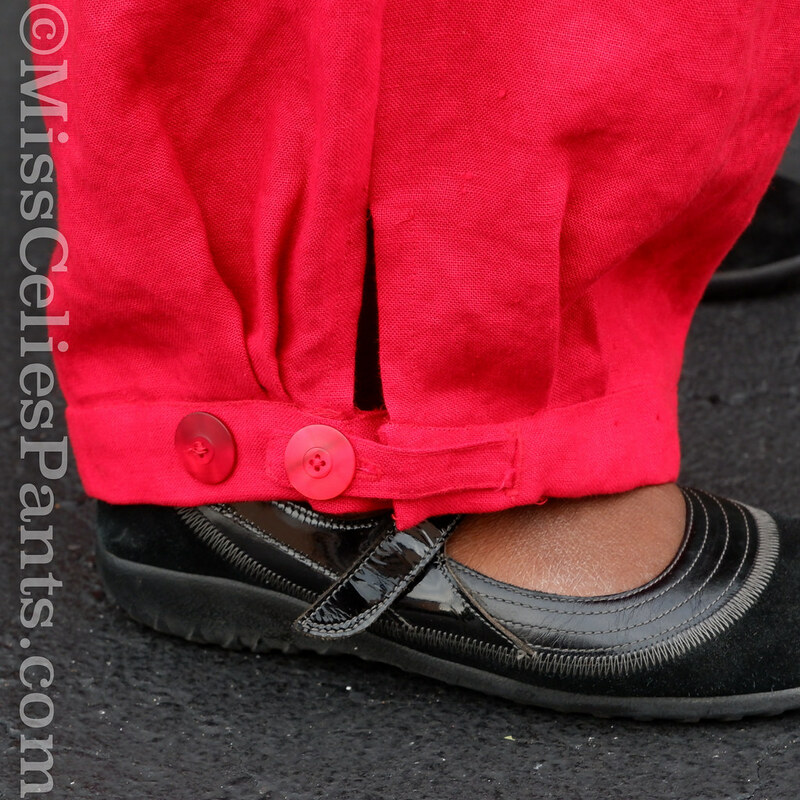 For this pair I chose the #139 from the April 2011 Burdastyle. This is a plus size pattern. I’m a 42 at the waist and a solid 50 through my lower thighs. My first two muslins were TERRIBLE. At the front I could see it straining across my jutting thighs. There was also not enough clearance for my stomach and the crotch was rightupinthere. 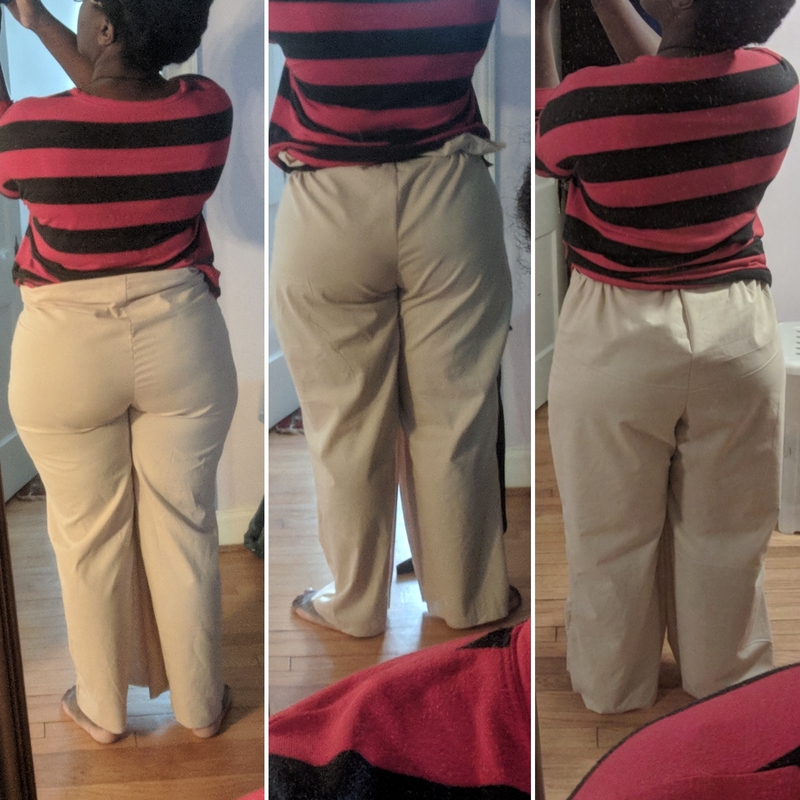 On the reverse, not enough room for my protruding seat, a serious need for a swayback adjustment and also, not enough length in the crotch (you can see it pulling it up at the center thigh) By the third muslin on the far right, I was much happier with the fit. 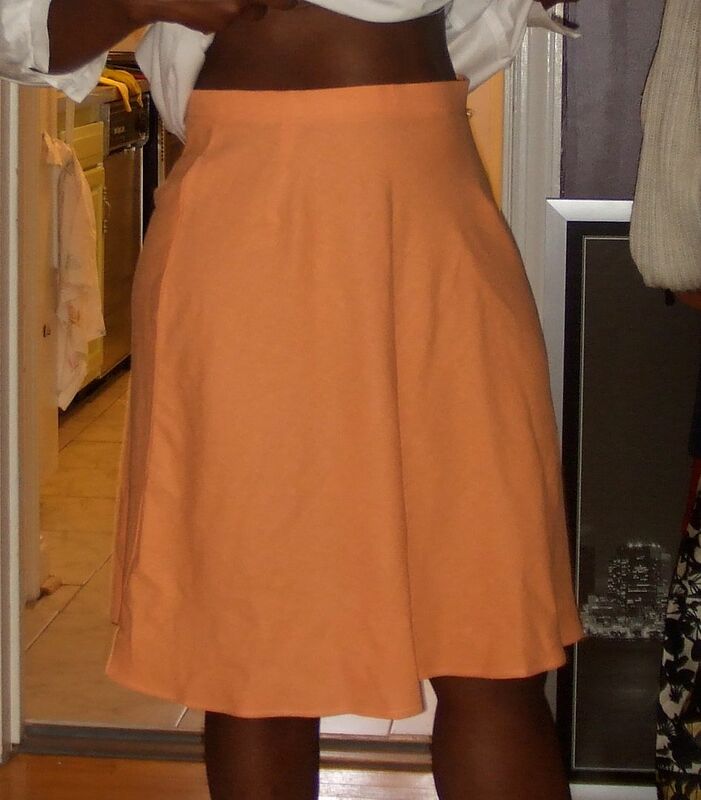 For the waist, I used a 2″ elastic vs the 1.25″ it’s drafted for. I just love wide elastic waistband. I think it looks more finished — especially with topstitching. 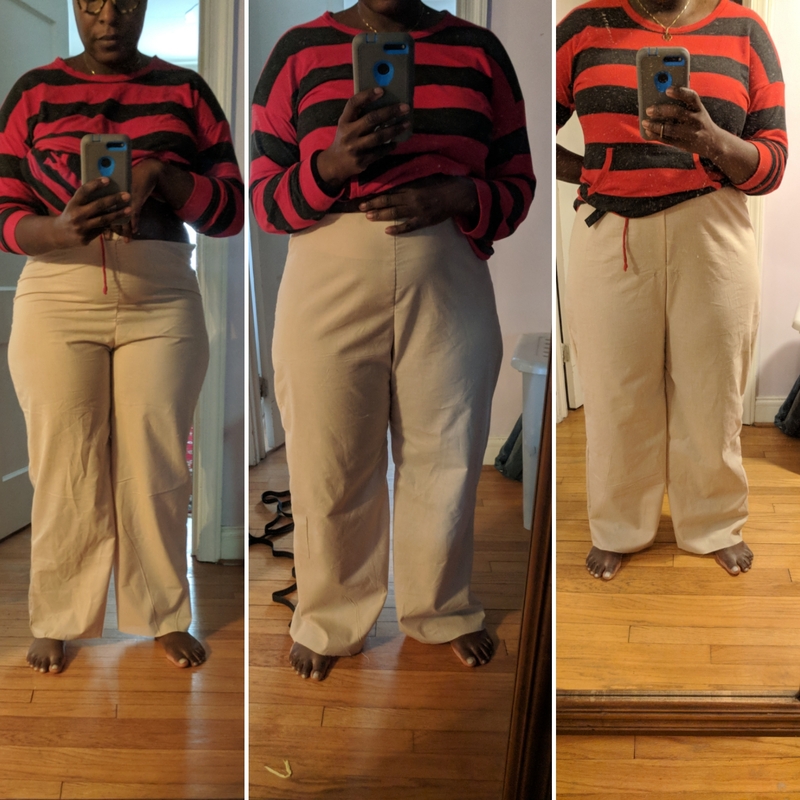 This is a knit heavy stretch elastic so I cut it just 2″ smaller than my waist measurement and it grew a little less than 1″ after application and topstitching (making it the 1″ smaller than my waist measurement a heavy stretch should be). 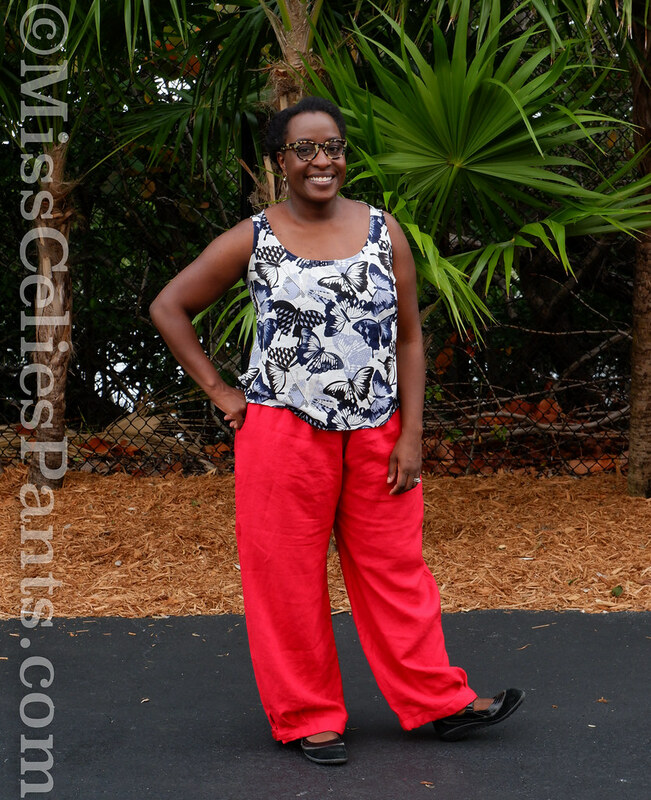 You’ll note I skipped the hem band treatment on these pants. I decided I really liked this color and plan to wear them to work this summer. By keeping the bottom of the leg simple I think they are a hair more professional and less likely to be noticed when I wear them several times a week. 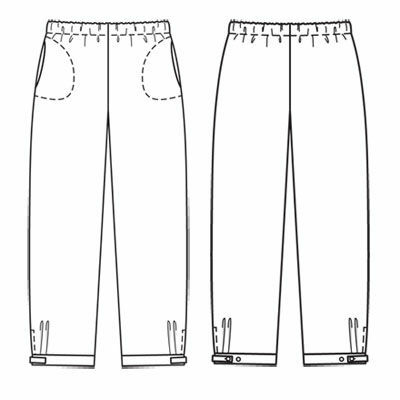 I am thinking about reducing by a 1/4″ the length in the back crotch and shortening the rise another 1/2″. I’d like them to fit around my crotch a hair snugger. But, overall I am REALLY happy and plan to make several more over the summer. I’m borrowing a camera. I don’t want to harp, but I’m sorry about the low quality of the photos. I’ve taken to photographing facing my screen door for sunlight. But, it’s pretty overcast. We have 98 percent humidity and thunderstorms. Blech. I thought between humidity and the low 90s it was a good day to test out part of my China capsule (I bet you’re thinking September can’t come soon enough so I can stop talking about China, lol). At any rate, I’m thinking of raiding the coverstitch fund for a used Nikon D40 — a DSLR camera I’ve wanted for the last three years. There is so very little to say about this bias skirt. It’s a very basic design with just one pattern piece. **Will have to update this. I’m showing the wrong pattern line drawing. ** I think bias skirts can be a neat first project. There’s minimal fitting and the bias lends itself to design interest. I like this tangerine linen. It washed up incredibly soft and falls beautifully. Plus, it adds a great punch of color. I’ve really liked orange lately, but don’t like it close to my face because it sometimes, er, well — matches my hair color, LOL. 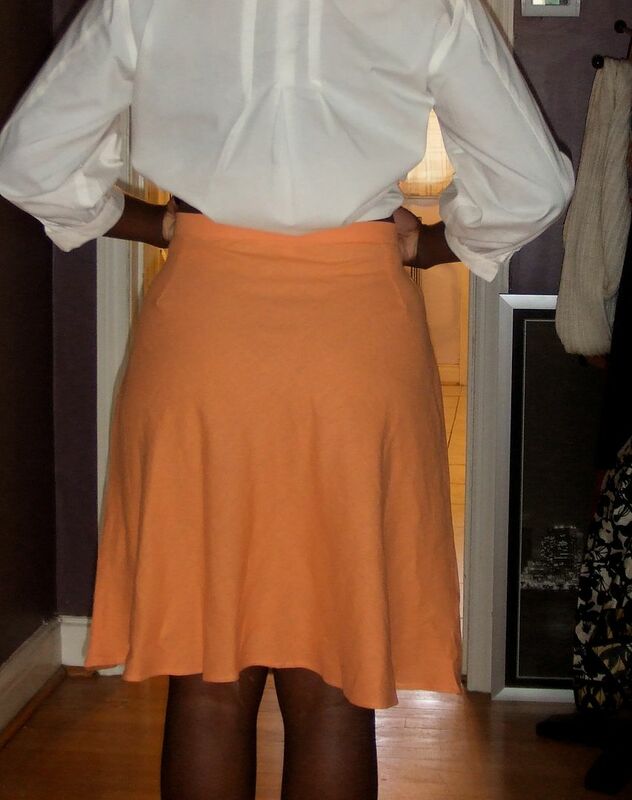 For skirts like this, I prefer the speed and ease of a narrow waistand. I use Dritzs’ Perfect Waist Maker. I bought about 10 yards of it in Portland last summer. I should have bought all of it. It’s a fusible interfacing with perforations at the fold line. I could have done a very slight swayback adjustment. But, I didn’t bother. I let the dress hang for a few days so the bias portions would grow. There was easily almost a two inch difference in some part of the hem length. I shortened the pattern by three inches. at the hip. I made a narrow hem on my machine. 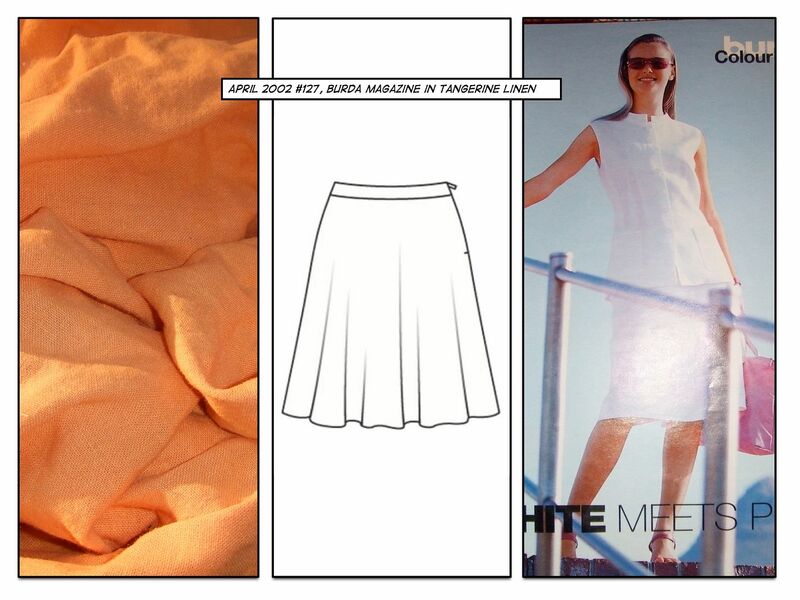 I can’t think of anything else to say about this skirt. 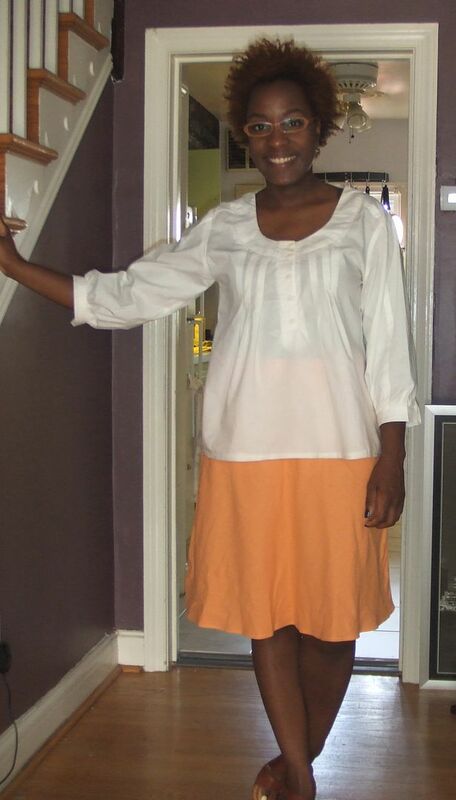 Except, the first time I made a bias skirt, I had to have a friend hem it for me. I just couldn’t handle it five years ago.